Coming off a recent business trip to China, I wanted to share my thoughts on the rapid and significant progress we’re seeing in hydrogen and fuel cell activities in China in the past few months. This past summer has been a busy one for Ballard in the region. We successfully opened our stack joint venture production facility in Guangdong Province. We also attended numerous meetings with senior government officials, both at our headquarters in Vancouver and various provinces throughout China. During these government meetings, I had the opportunity to share Ballard’s recommendations for advancing the commercialization and scaled adoption of fuel cell vehicles in regions throughout China. These recommendations include the establishment of a “30 by 30” fuel cell policy – meaning that 30% of all electric mass transit buses and commercial trucks will be Fuel Cell Electric Vehicles (FCEVs) by the year 2030 – as well as the formalization of appropriate policies and funding support for hydrogen fueling infrastructure. Government representatives have been receptive to these ideas, recognizing the significant potential positive economic and environmental impacts of the hydrogen and fuel cell industry. We continue to see important progress in China. At the federal level, China is now studying a timeline to completely ban diesel and internal combustion engines in transportation. At the provincial level, we are seeing strong commitment from Guangdong, Jiangsu and Shandong provinces. At the city level, we are seeing increasing leadership to address air quality by reducing vehicle emissions. In particular, Shanghai is leading the way with a visionary and landmark fuel cell initiative. Indeed, Shanghai has laid out the most comprehensive and aggressive city plan in the history of fuel cell vehicles. In these aggressive production targets, policy makers have recognized the significant cost reduction potential that comes with mass manufacturing volume and associated economies of scale. 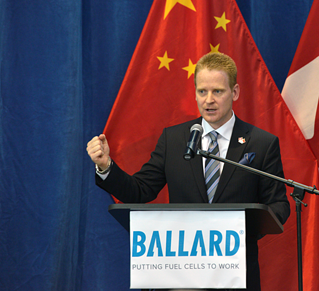 At Ballard, we will continue to lead industry and do our part to advance fuel cell adoption. We are working on next generation technology and collaborating with our partners to support the delivery of FCEVs in key market applications, including fuel cell buses, that will be cost competitive with battery powertrains – while offering much higher value on range, refueling time, route flexibility, and weight . We also expect these FCEVs to have lower operating costs than a diesel bus while offering zero tailpipe emissions and a quiet and smooth driving experience. While we are driving hard with our OEM and ecosystem partners to achieve our cost reduction targets, increased market demand and manufacturing volume will be key success factors in meeting these objectives. The Shanghai Fuel Cell Vehicle Development Plan accounts for this reality. Ballard is well positioned to support Shanghai’s aggressive plan through our established partnership with Zhongshan Broad-Ocean Motor Co., Ltd. As you may recall, earlier this year we signed technology transfer, licensing and supply arrangements for the assembly and sale of Ballard’s FCveloCity® fuel cell engines in China. We are currently supporting Broad-Ocean’s subsidiary, Shanghai E-Drive, in setting up a final engine assembly facility in Shanghai (and other key centers in China). This facility will play a key role in meeting Shanghai’s production goals. We are also exploring additional opportunities to strategically position Ballard in the attractive Shanghai market. We are excited by the vision and leadership reflected in the Shanghai Fuel Cell Vehicle Development Plan. The Plan represents a strong commitment to the commercialization of fuel cell vehicles in China’s largest city as an important measure to address air quality. Ballard is well positioned to be an important player in the execution of this milestone Plan. Of course, hydrogen fuel cell development plans are not limited to Shanghai within China. In the past two years, relevant government ministries and commissions in China have issued policies that strongly support the adoption of FCEVs. In addition, the discussion has expanded to the complete phase-out of fossil-fuel vehicle sales. We see clear FCEV opportunities for buses, commercial trucks, and rail. Other regions have taken notice of China’s decisive actions and are considering following suit. France and the UK have plans to eliminate fossil-fueled vehicles, and now the California government has expressed interest in a similar move. And, last year’s formation of the Hydrogen Council – founded by sixteen of the world’s most important companies in the fuel sector – is already proving to be an important development. Do you think it is time for other regions to follow China’s model and take wide-sweeping action to address air pollution from transportation? What do you think about Shanghai’s plan? As an industry, what can we do to encourage other cities to adopt similar development plans to facilitate the wide-scale adoption of hydrogen fuel cell technology? Join the discussion and let us know your thoughts below and on social media.